packages are often shipped out on thursday & friday. Thank you all for your love and amazing support. HOUSE8 is a place for natural magic. stones for meditation. 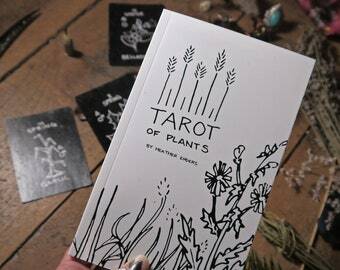 zines and resources for earthy beliefs. beautiful tarot decks. talismans to give aspects of your life a boost. and herbs to do the same, or to help you create your own. born and raised in central massachusetts, heather has always had an eye for the odd and a beautiful hand. enchanted with nature, it is commonly her subject, which can take form in photography, fibers, or painting. MassArt graduate spring 2012. If you really wish to return something, please message me and we can figure something out. However, the customer will have to pay the return shipping. payment must be made within 3 days of purchase, or it will go back to shop. please message me first if you need to make a cancellation and it must be before I mark the item as shipped. If you would like an item shipped somewhere that I don't have listed, please message me and we can work out the shipping cost. insurance is up to you. If you want it, let me know beforehand, and the customer pays the extra for insurance. I mail through USPS. I try to get the package out as soon as possible (within a week) but i am located in a rural location, so weather and other issues do come up. if it is longer than a week i will give you a heads up. all purchases will include a charge for 7.57% sales tax regardless of where you are located. I'm based out of New Mexico which enforces a Gross Receipt Tax (instead of Sales Tax), which means i am required to collect and pay 7.57% tax on all income. Never hesitate to message me about anything! I enjoy it, really!